: Don't worry about it. : I thought the silent types would get along. Why, are you jealous? Relax, relax. 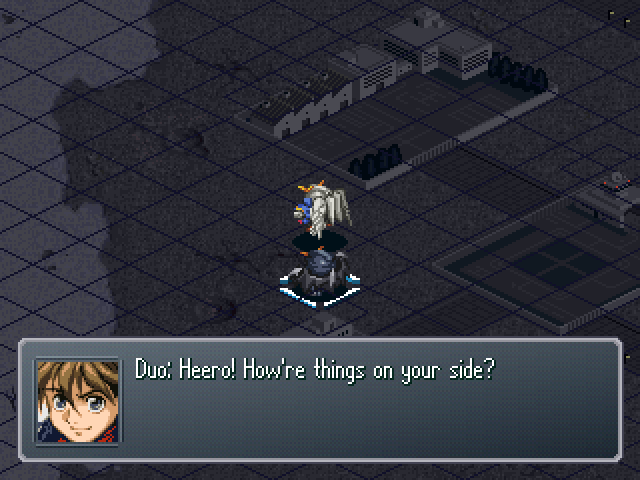 Heero's head-over-heels for another girl, so no need to worry. : There's no time to waste. We're evacuating this place. : OK! 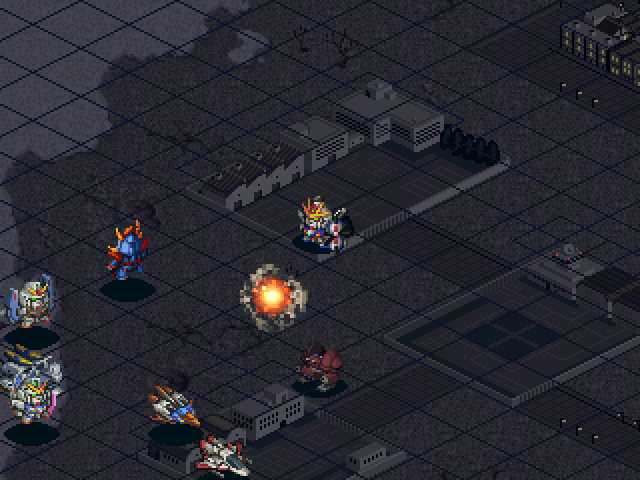 Just got word from Quatre, they'll be here in another 5 minutes! : I wouldn't care either way, but if it's double, well... Do it right, you scumbags! : What is it, Br... Er, Captain? : I've got a bad hunch. Be ready to run at any time when I give the signal. : Got it, If you feel that way, Bro, you're probably on to somethin'. : Now then, let's head for that area and blow this popsicle stand! 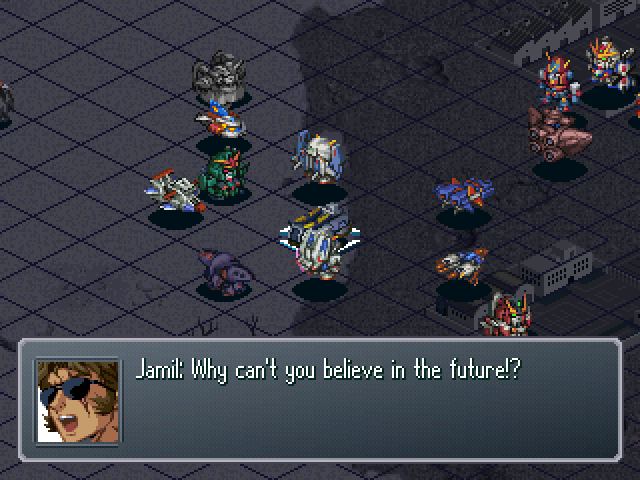 : Got it, Heero? 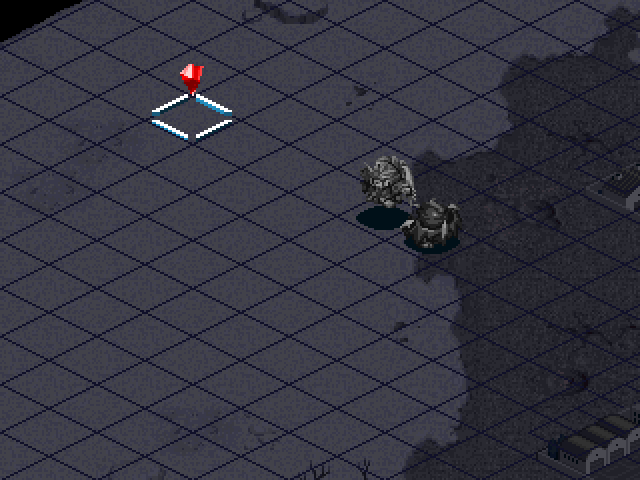 Don't waste time on enemies, just get there quick! We got 5 minutes! 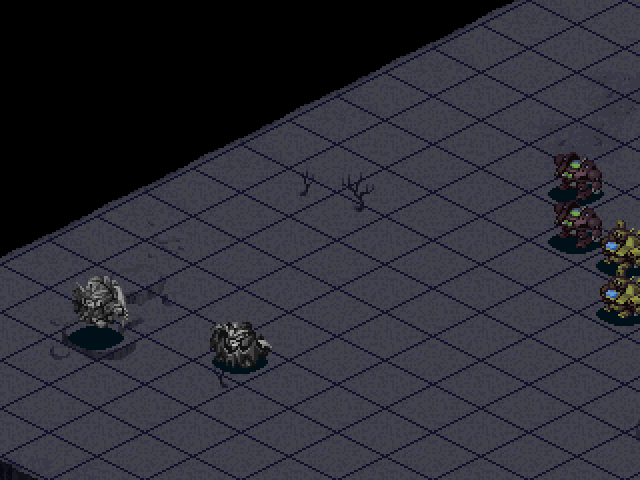 If we hang around longer, the enemy'll surround us! : Roger. Don't fall behind, Duo. Nothing to do in the first part of the mission but to head for the designated area. 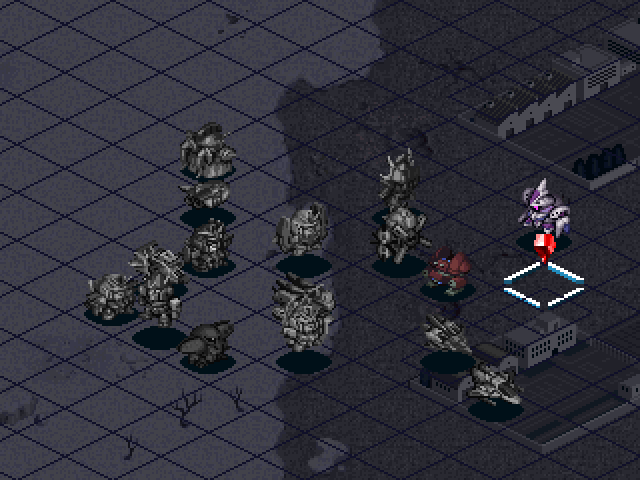 A few of the enemies will follow you, but they won't catch up with you until turn 2. A Government is the first to reach us, and attacks Duo. His life was the first that the Grim Reaper would claim this day. Another turn passes, and Duo kills a few more dudes. : Looks like we somehow managed to make it! 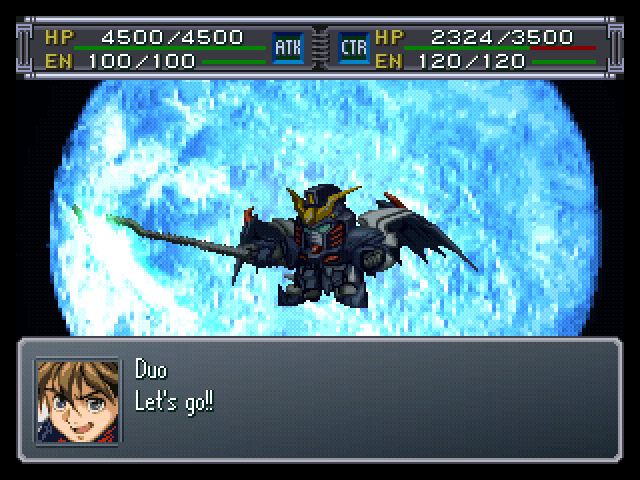 : Heero, Duo! You're alright!! Sure we are. We do this kinda thing all the time. : Duo, get to the Freeden! I'll hop aboard the GX!! : I want to... 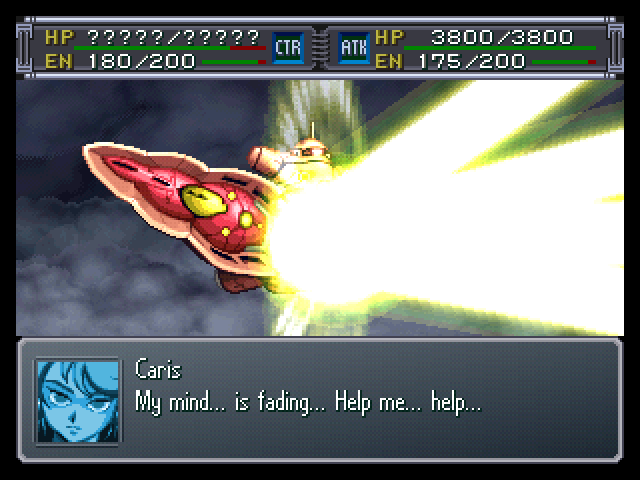 I want to save Caris!! : Please... I want to as well. : ...Fine, I got it. : No. If somewhere in his heart, he truly doesn't wish to fight... 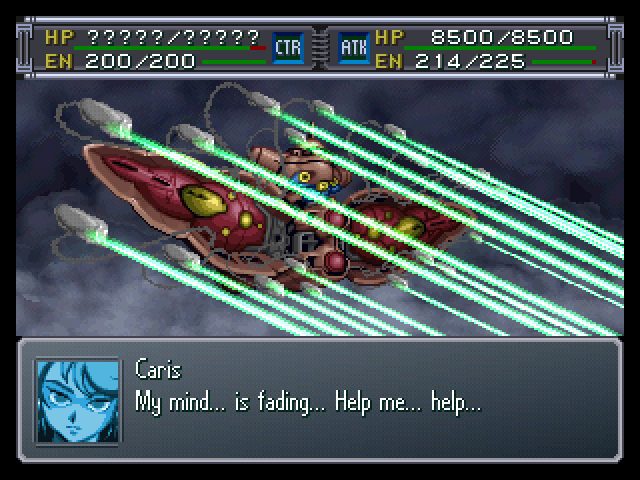 If you destroy the machine he pilots, you can save him. : Sure. 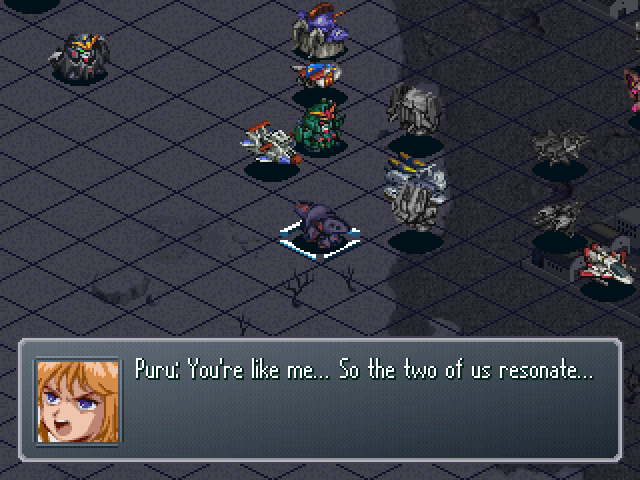 Four and Puru got rescued by Kamille and Judau that way. 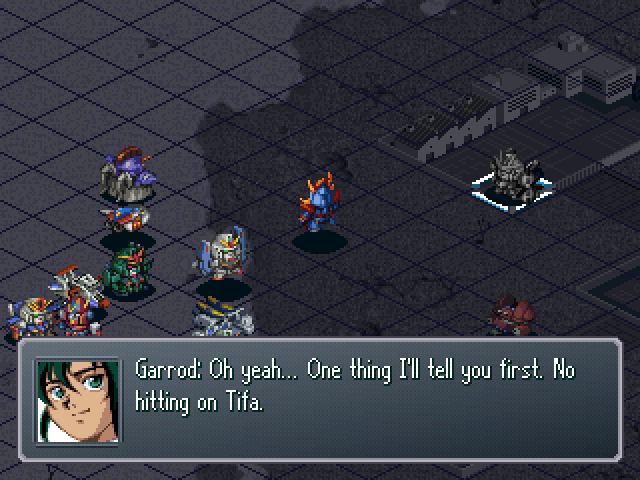 : I believe in Garrod and Tifa, the same way I believed in Judau then. : Those who have lost their way... Sometimes have the courage to spurn their path. 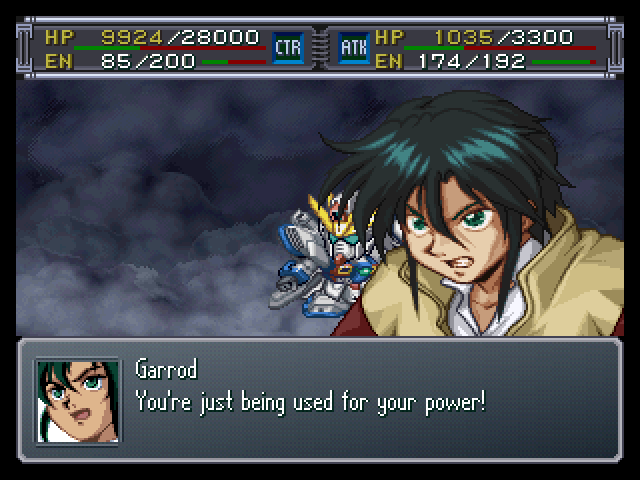 : Yeah, Garrod. If you don't save people when you can, you'll regret it later! 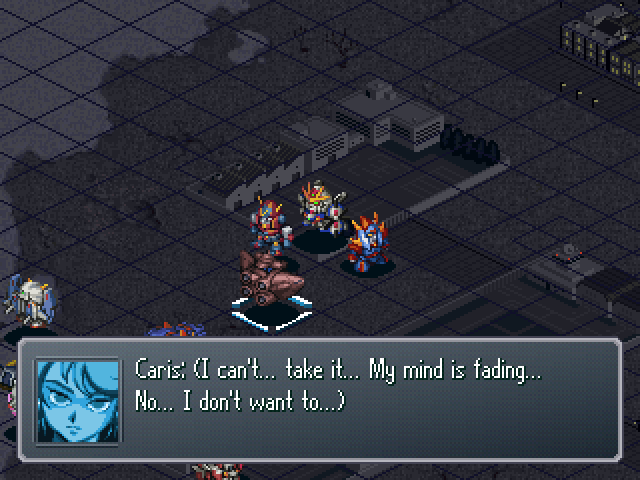 : Plus, I can't allow Artificial Newtype research to go on any longer. 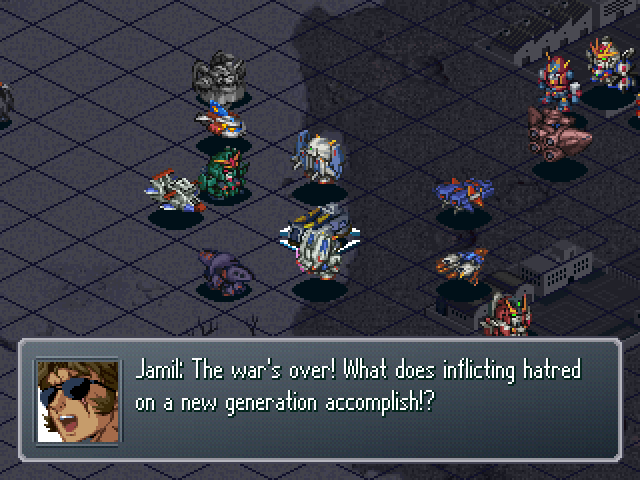 : Yes... Cyber Newtype creation is an act we should never condone! 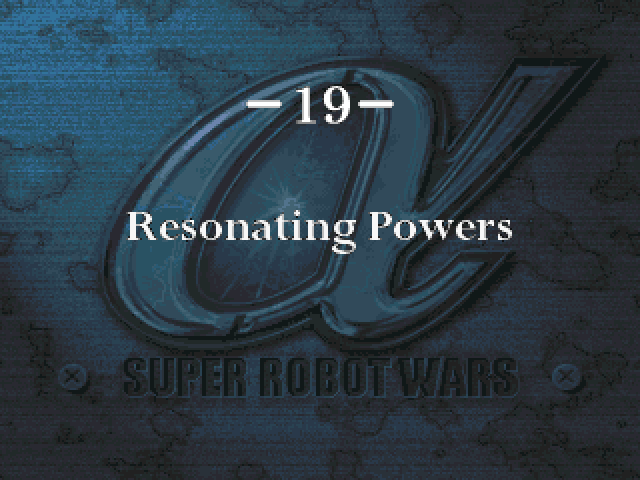 : Well, saving people is one of our goals. 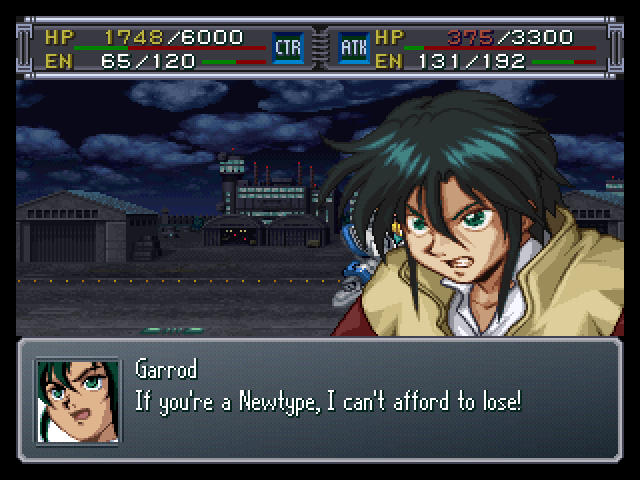 We'll help you out, Garrod! 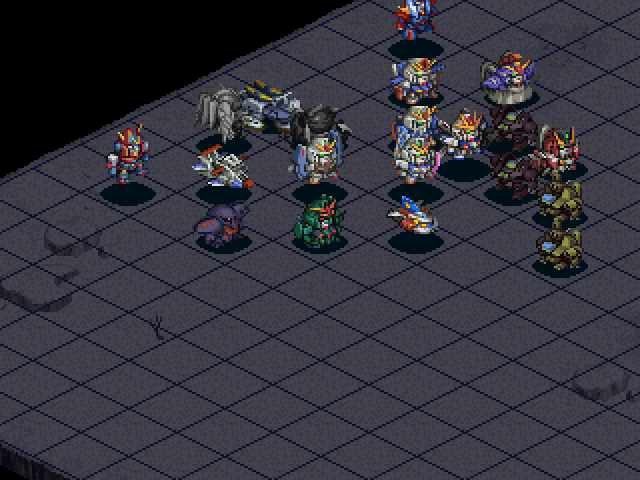 : All units, launch! Send out the GX too! 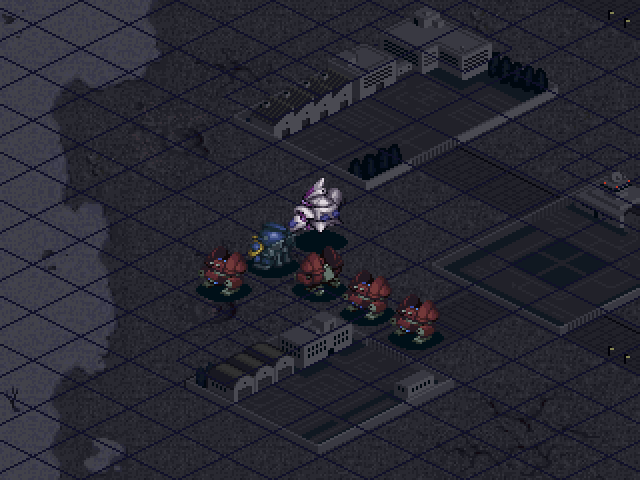 Those four grunts are about to have a really bad day. 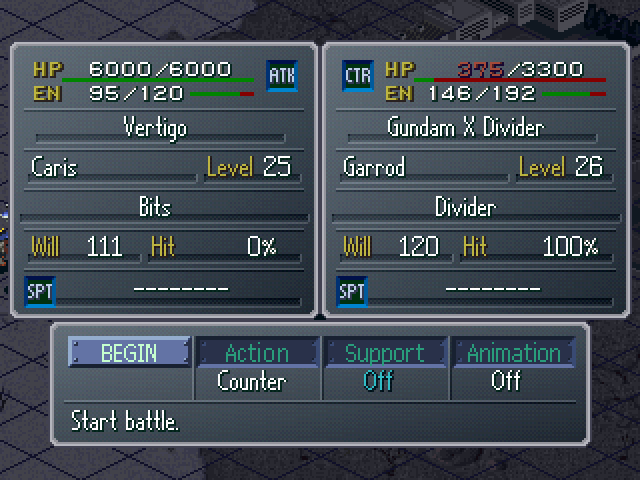 : So this is the Gundam X Divider! It's got more mobility than it had before! : Nice going, Kid! Great work! : Hold on, Caris! 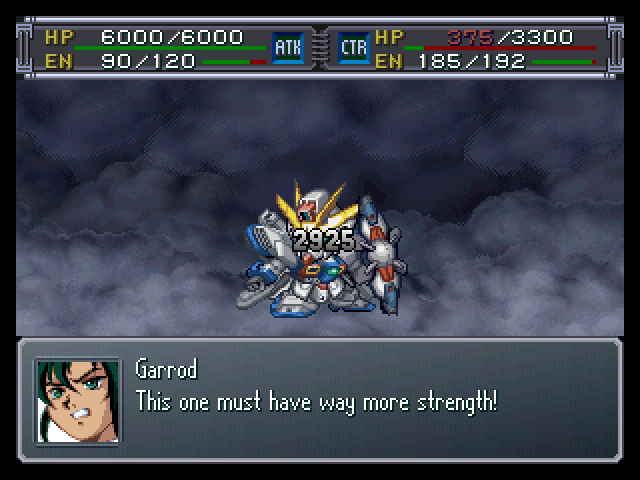 I'll destroy that Mobile Suit... and save you!! 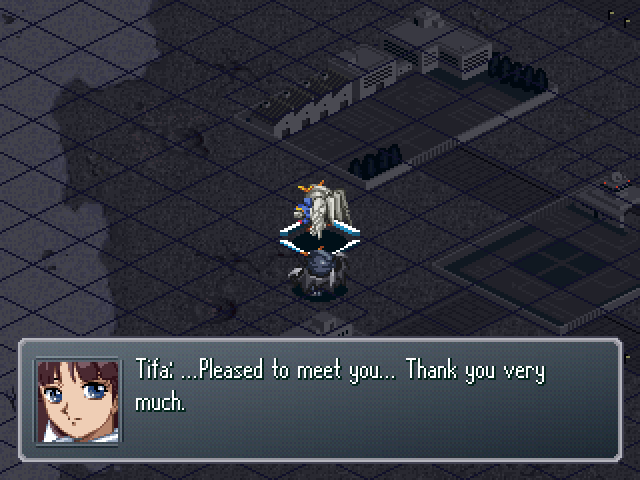 : The lady from back then!? : I remember! You're that surly chick!! 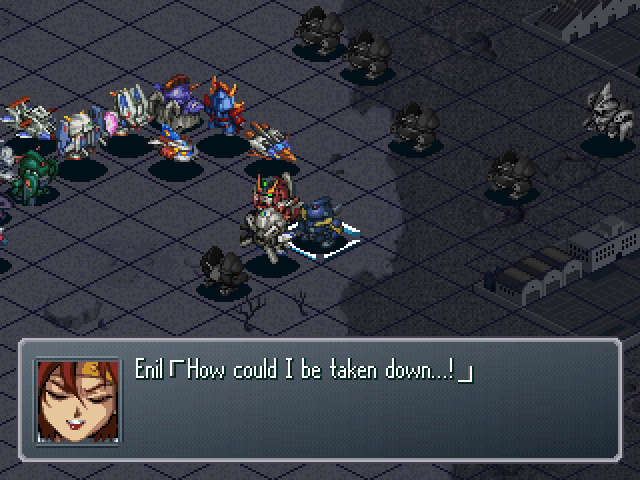 : What do you have against me!? 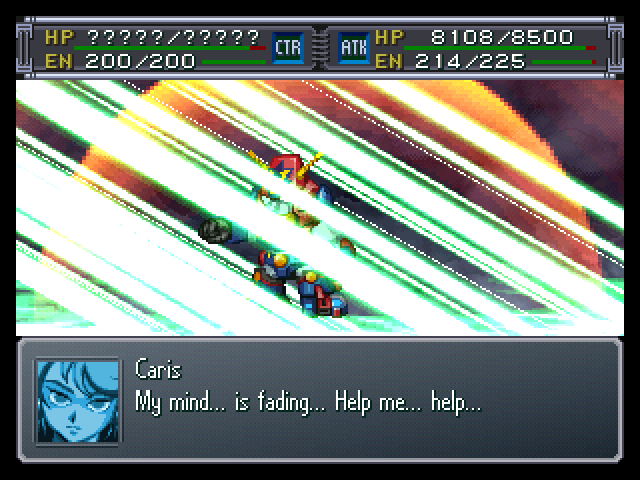 Is this about not buying the Gundam!? : ...You rejected me. Do you know what it means to shame a woman like that? : Those who refuse me... can all die! : Damnit, I don't have time to waste on you right now!! : It's the opposite of how it goes for Usso, huh? 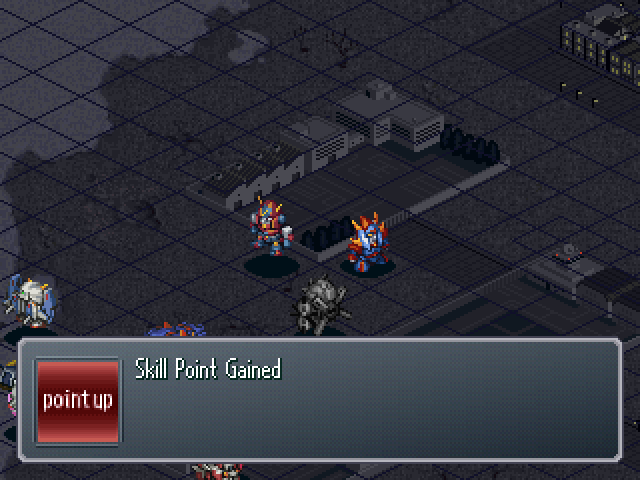 The four grunts didn't last long once the dialog ended. 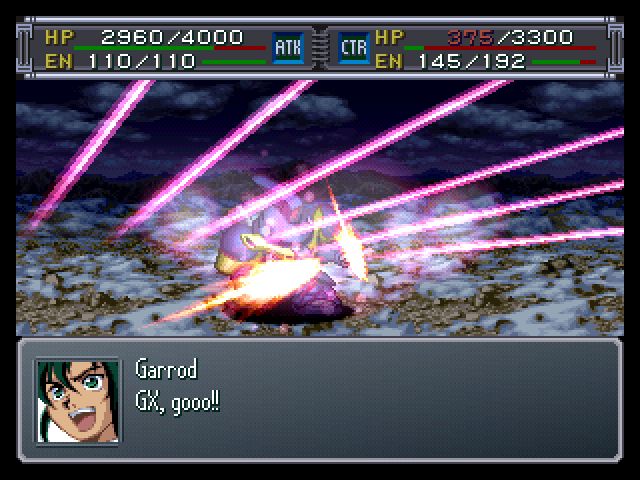 Why would I pass up an early opportunity to activate Guts? Caris easily dodges the Divider attack. 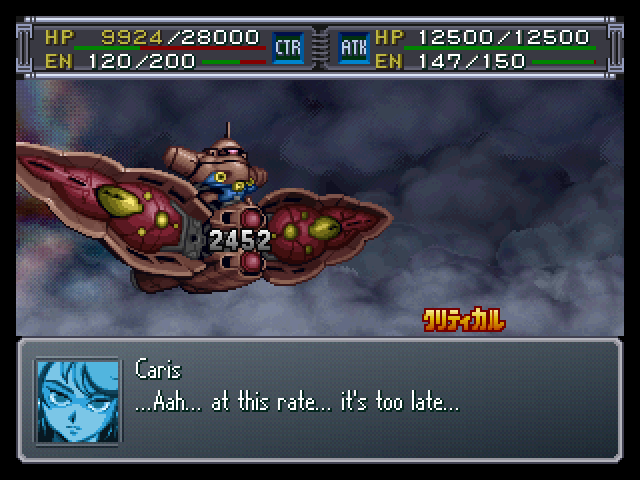 Next turn, I dealt with most of the remaining grunts and almost surrounded Caris. Hola and Vickman are still staying in the back. those numbers are a lot more favorable. 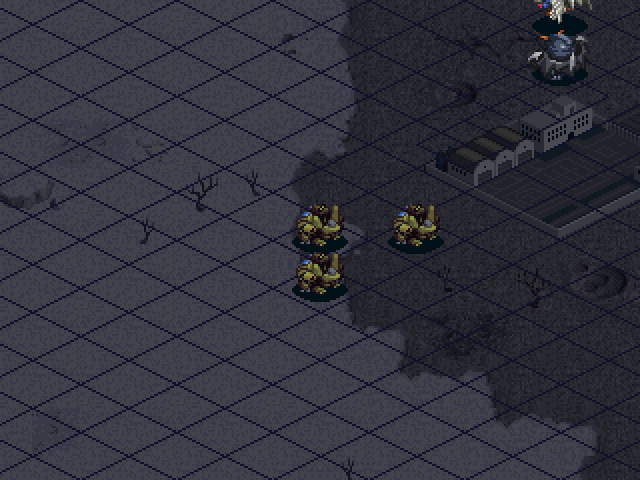 At the start of the next turn, I park Garrod onto one of the base tiles and finish off Caris. : What're you doing, Caris!? 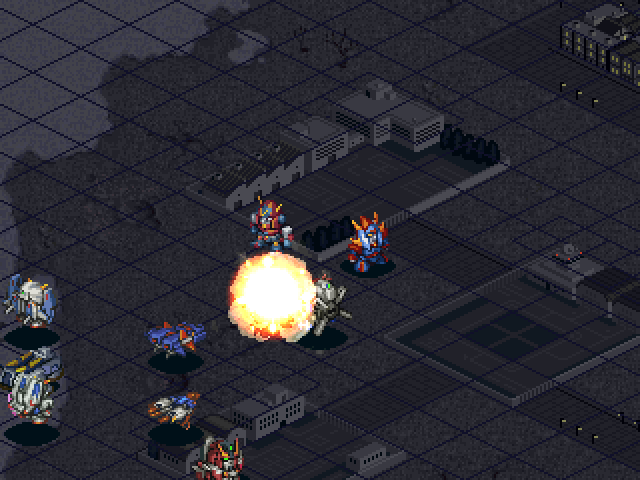 You're going to get caught in the explosion!! : I'm content with this... 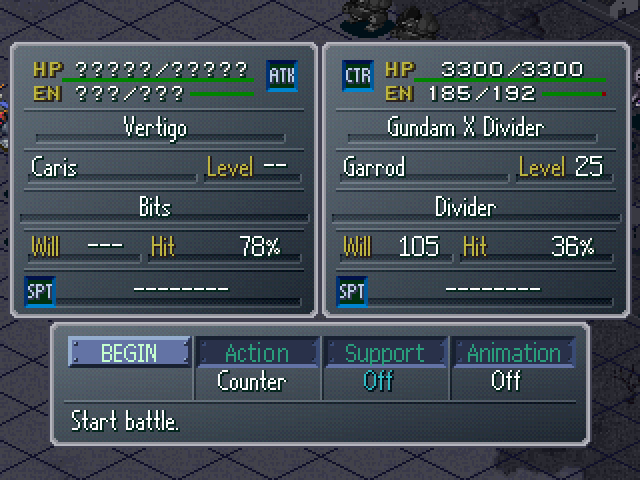 I fought as an Artificial Newtype and lost... I have no regrets now... I sensed the Mayor's heart. Then I realized everything. That I was just a tool to inflict the Mayor's hatred on others, nothing more. I'm truly a weak man... 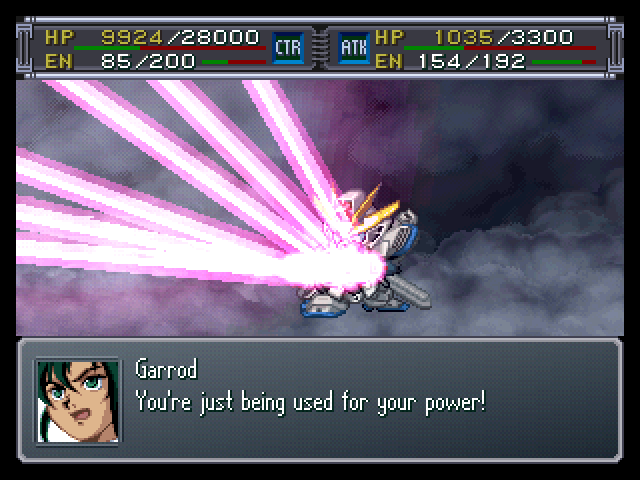 So help me, Garrod. 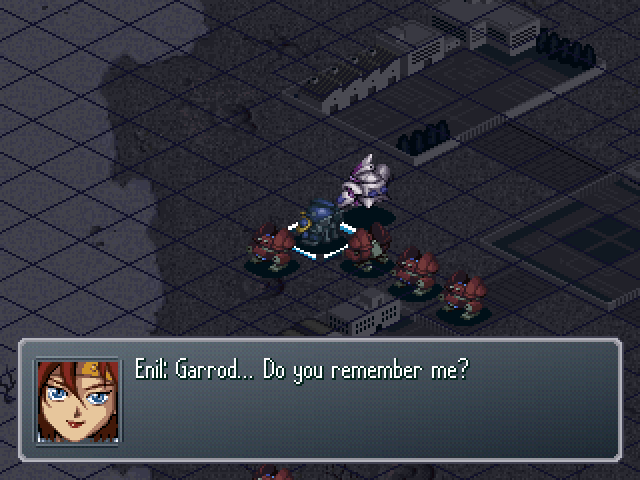 : This can save my soul, and the souls of those who died to make me what I am... Come, Garrod... Shoot me for the fool that I am. : It's alright. The escape pod ejected out... The pilot is fine. : ...Quit acting spoiled! 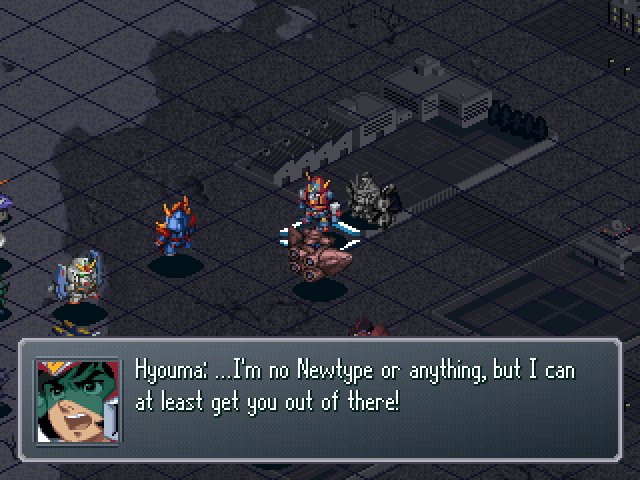 You chose to become a Newtype yourself, right!? You're dead wrong if you think dying solves everything! I won't accept it!! : Of course I am! : Sure. You're just like the rest of us. Right? 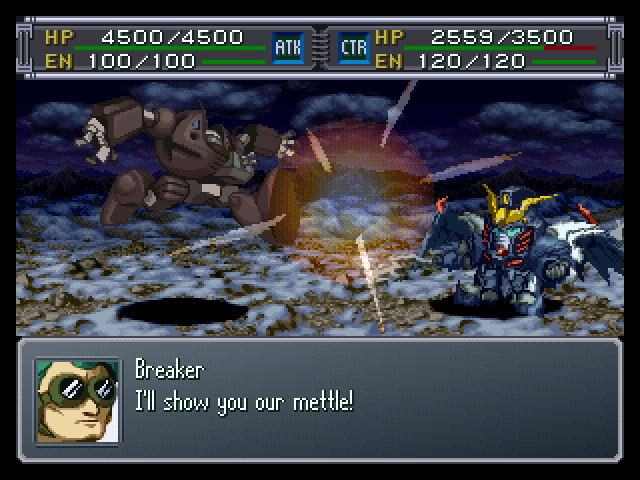 : Oh, and let's not fight anymore. You're pretty tough. 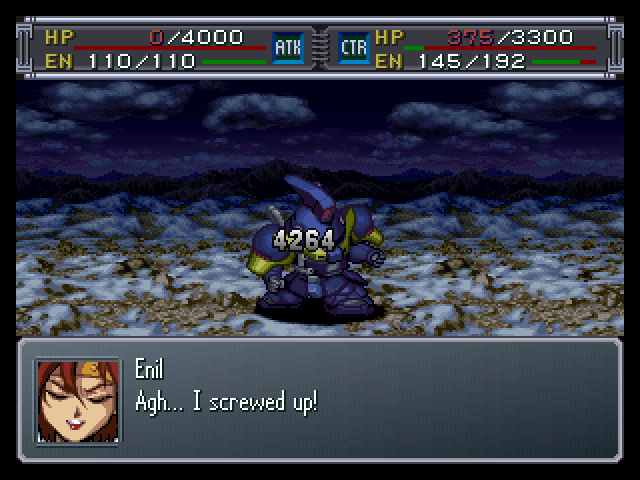 : Heheh... Alright. I promise. Does anyone else hear bells? 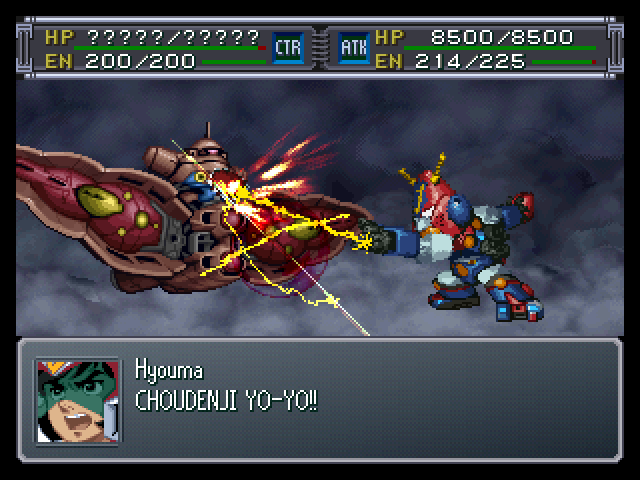 : The Psyco Gundam...!? No, it's different! : A sound like bells...? Is it resonating with the Biosensor!? 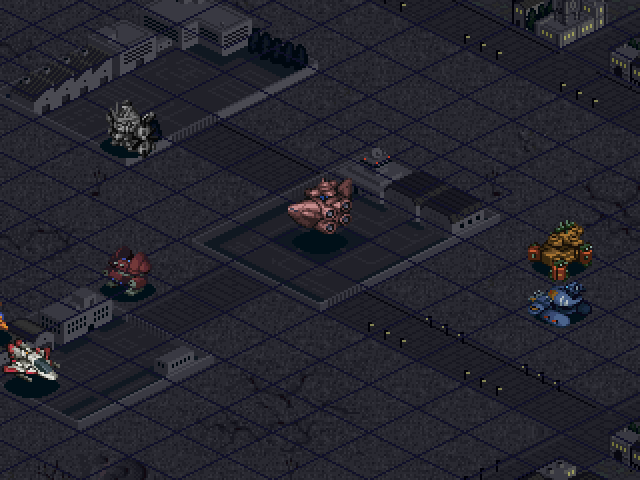 : Wh-what on Earth... What's that battleship-looking thing!? 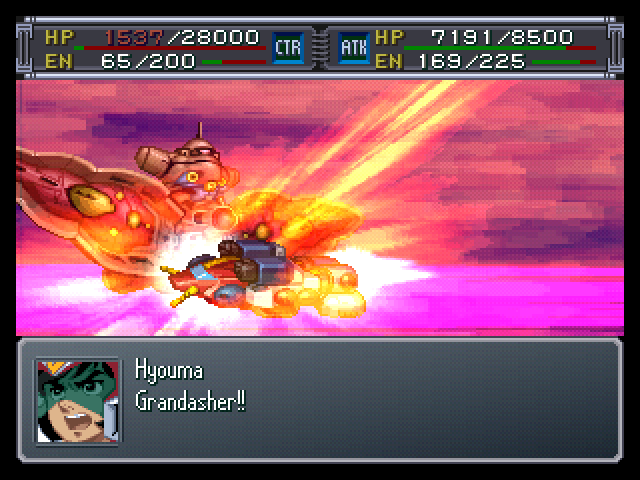 : That's no moonBattleship... 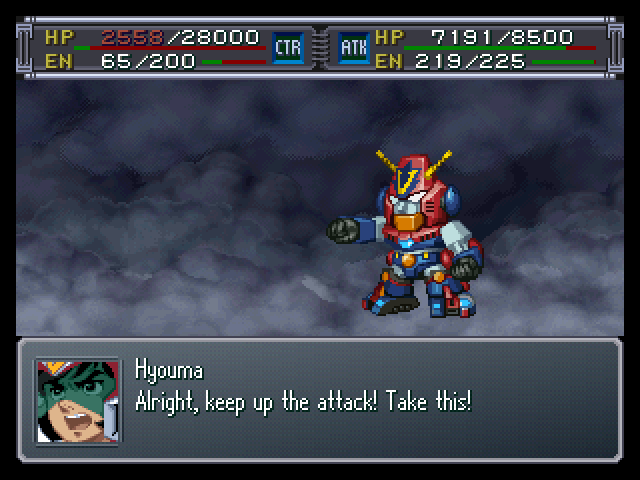 It's a giant Space stationMobile Armor. 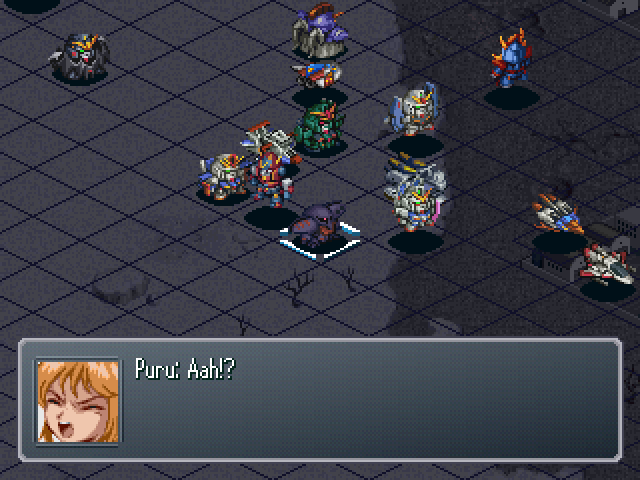 : A Mobile Armor!? It's gotta be at least 500 meters long!! 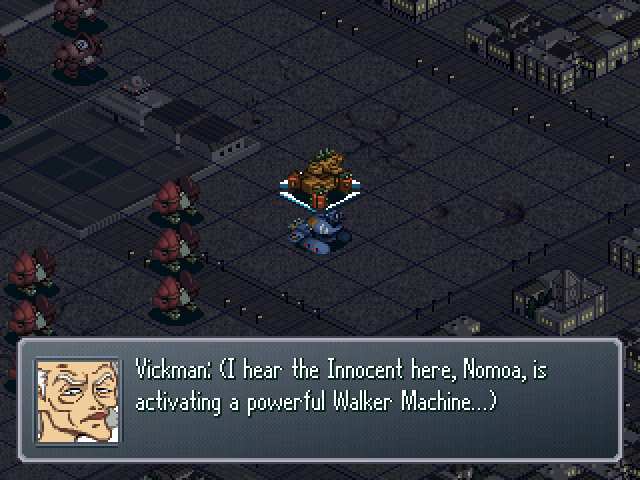 : It's no ordinary Mobile Armor either. 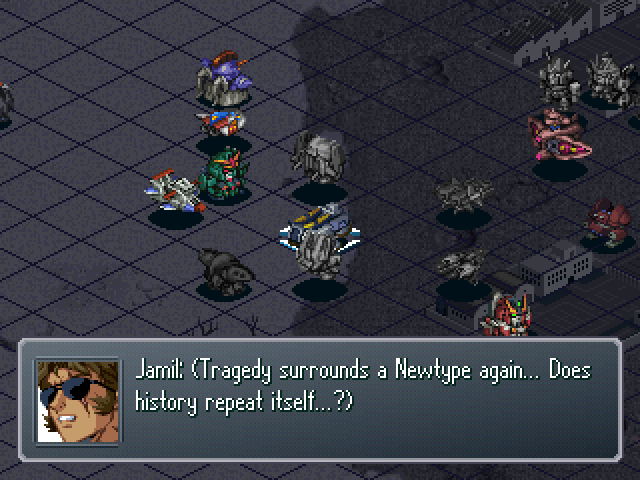 It's designed for Newtype us. 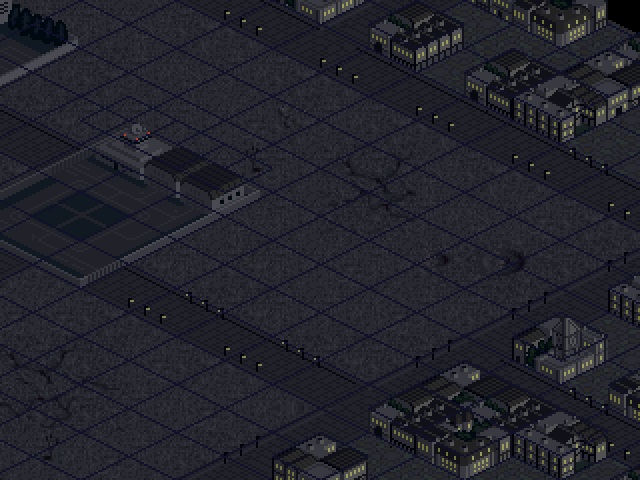 : Now all that's left is the finishing touch... To put in the pilot. : Captain! 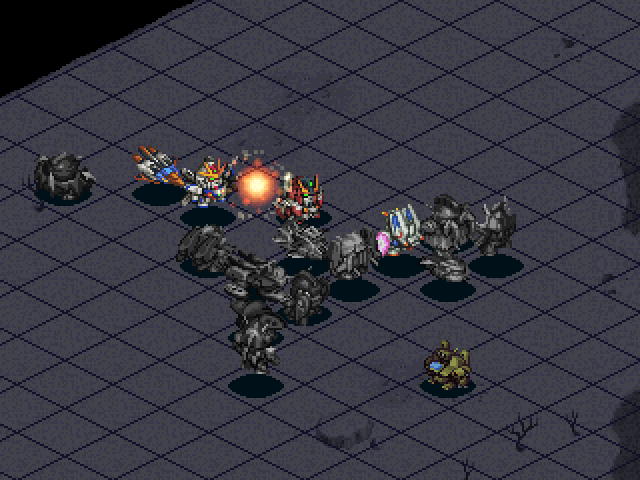 The giant Mobile Armor is closing in on us fast!! : What!? 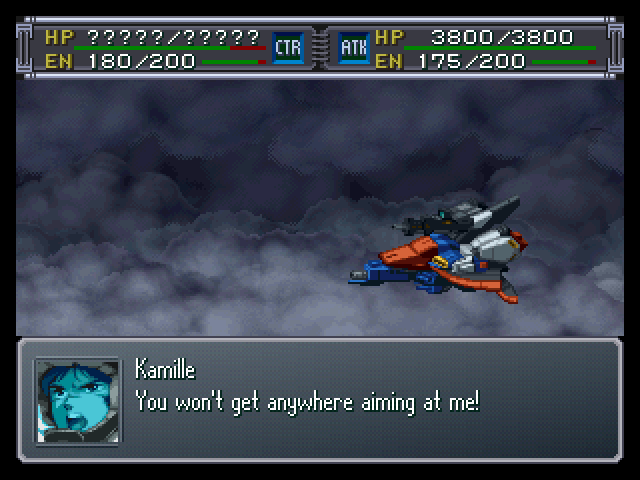 Take evasive maneuvers!! 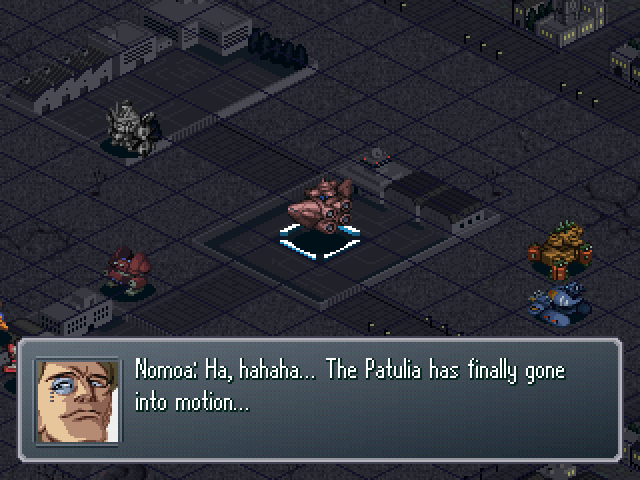 The Patulia moves to where Caris crashed. : Damn...! 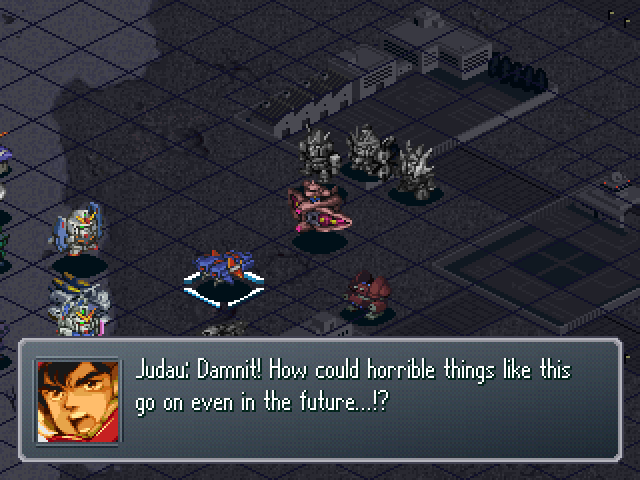 Was Lt. Amuro right before, must we always repeat the same mistakes!? : Give him back... Give Caris back... He finally smiled. It was only just slightly, but he smiled for the first time... 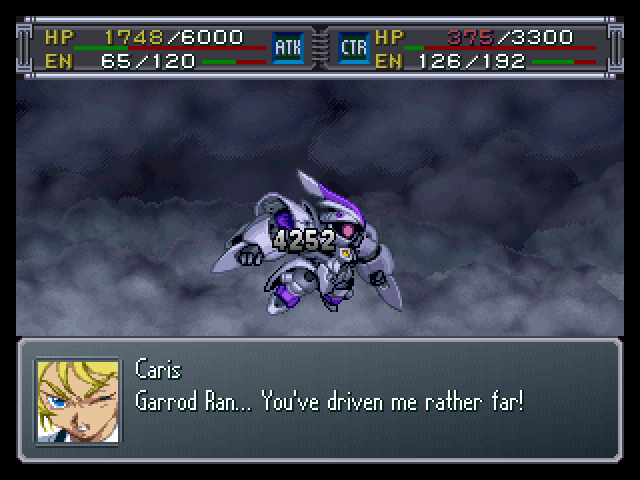 CARIIIIISSSS!! : Wh-what do we do!? 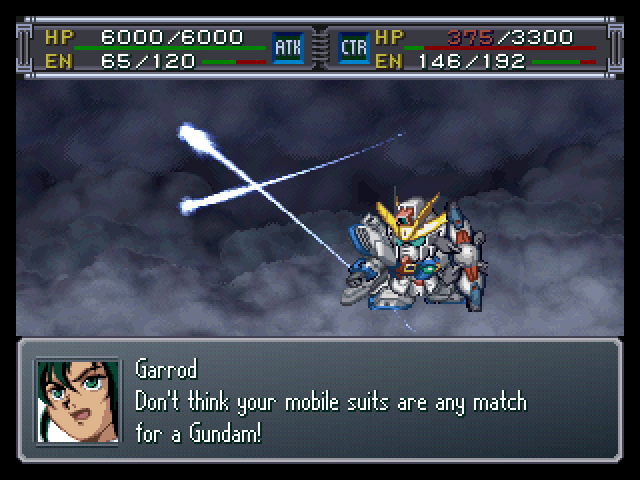 Sure, it's a newtype-use Mobile Armor... 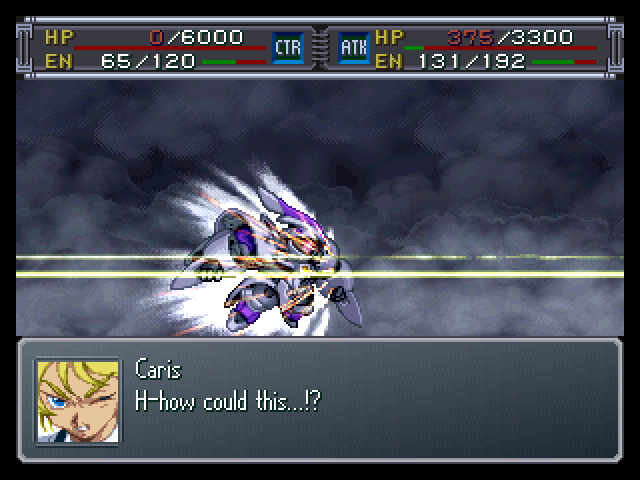 But it's in a whole different class from the Psyco Gundam or Alpha Aziel!! 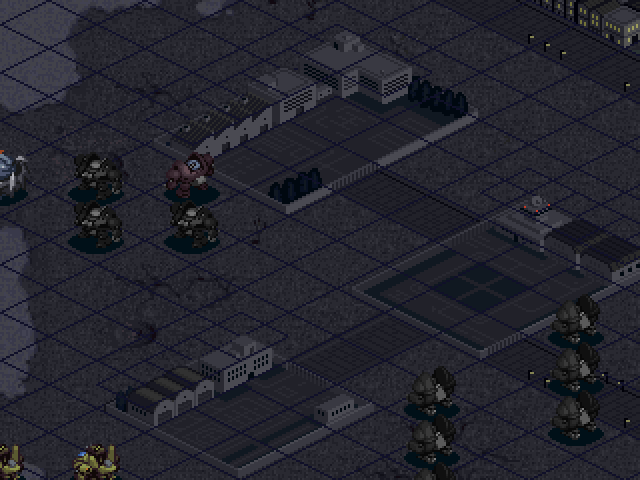 : It would take too long to destroy a giant MA like that from the outside! Focus your damage on one point and find a way to destroy it from the inside! : Yeah! I'll break in with the Gundam and get Caris out of there!! 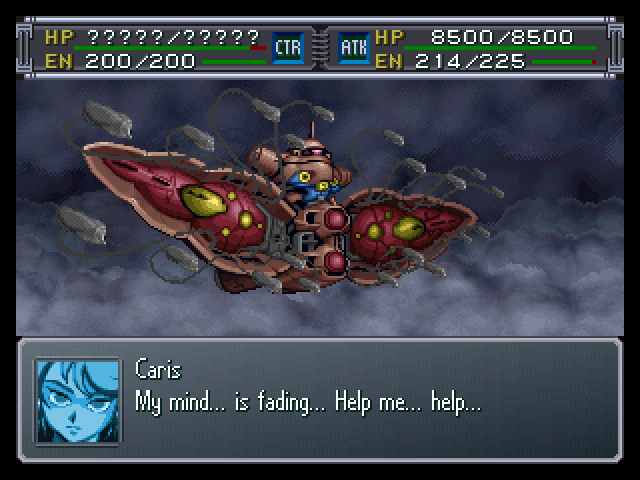 : Caris's mind is being broken down... Is that it, Tifa? : Yes. So please, everyone, quickly...! : You heard her! 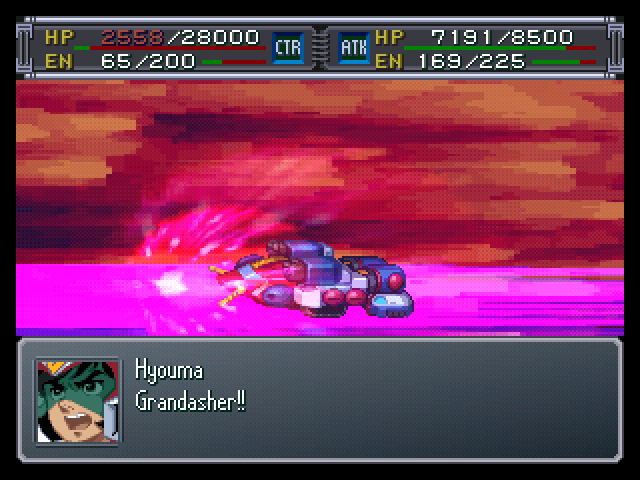 Pierce the Patulia's hull and get the GX in there in 5 mins! A quick note before I begin demolishing the Patulia. 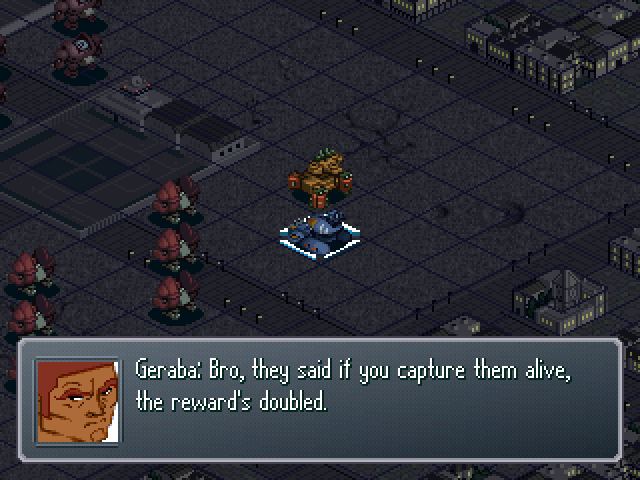 This mission contains one of the requirements I mentioned a couple of missions back for a secret later in the game. 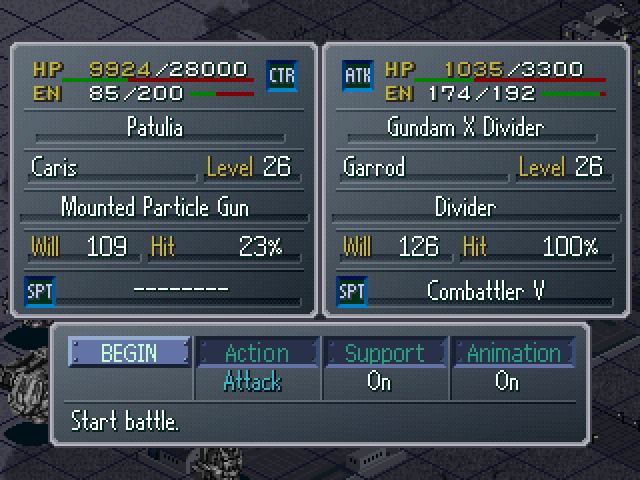 It's not as difficult as the first one, I just need to destroy the Patulia with Garrod. 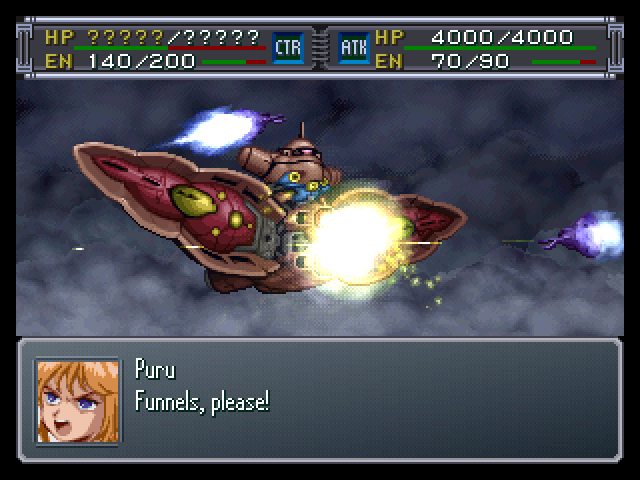 Luckily for me, the Skill point for this mission requires me to destroy the Patulia as well, so I can easliy kill two birds with one stone. 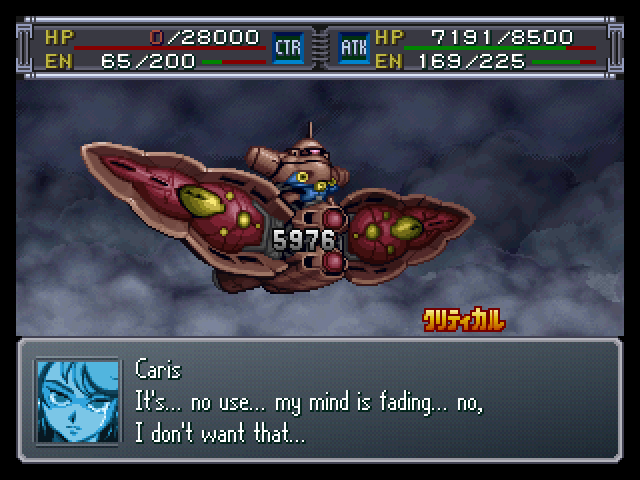 Also, don't worry about the Time limit, since it shouldn't take you longer than 2 or three turns if you've properly prepared for it. everyone also has little inspirational speeches to give to Caris, and I'll be posting the more interesting ones. : So don't give up! If you give in, what's the point of what we're doing!? : Idiot! If you're a man, show some guts!! : I'm not giving up... Not until we save you from that thing!! Yikes, that's a nasty little attack. That might have been too, if it had actually hit. 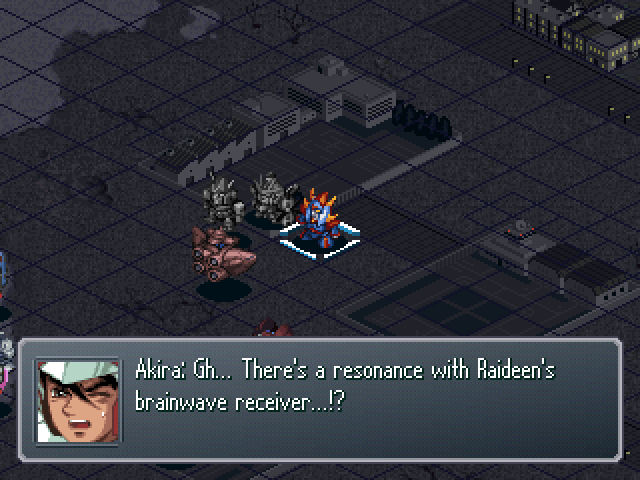 : What powerful mindwaves... Is this what controls that Mobile Armor!? : I can still hear the pilot's voice... We can still save you!! 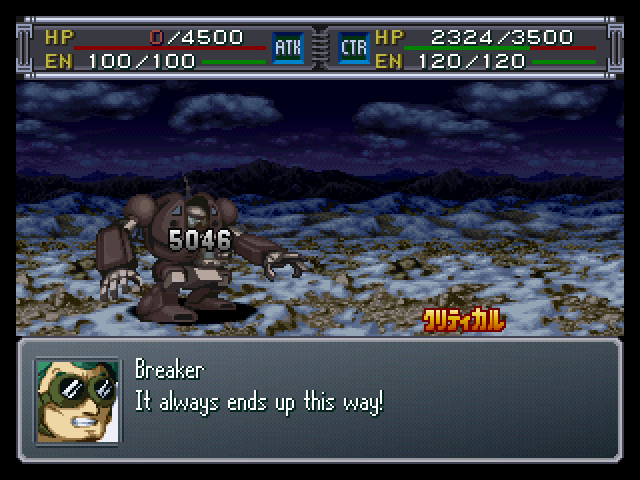 : Then I'll convey my voice to you... Raideen's voice! Don't abandon hope!! : Don't give in! You can't abandon yourself! HANG IN THERE!! : I know it hurts! But don't give in! You have to hold yourself together! : No, I won't accept that! 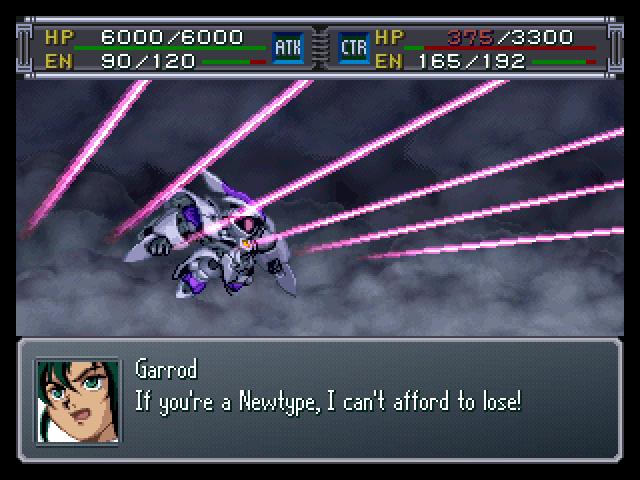 I'll support Garrod, and stop the Patulia! 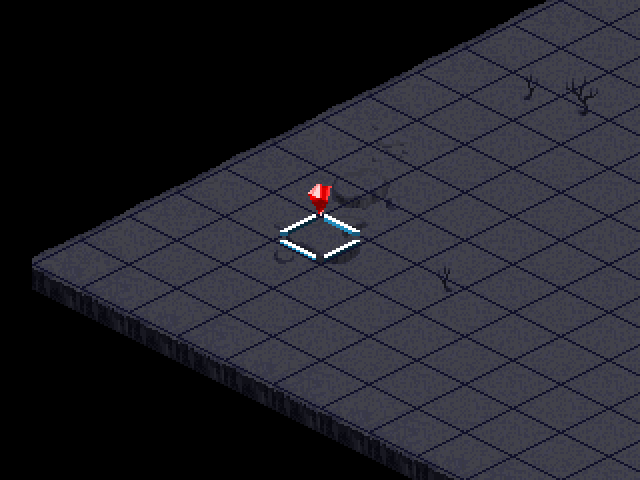 : ! His mind... It's fading... Hurry! Or it will never come back! 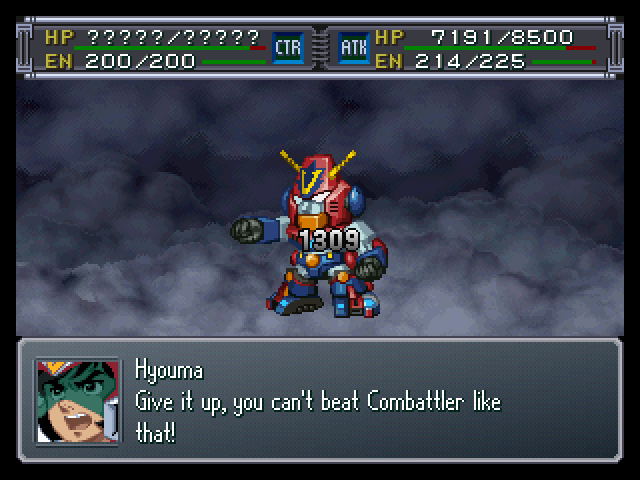 Followed quickly by a support attack from Combattler V! : What're you saying! 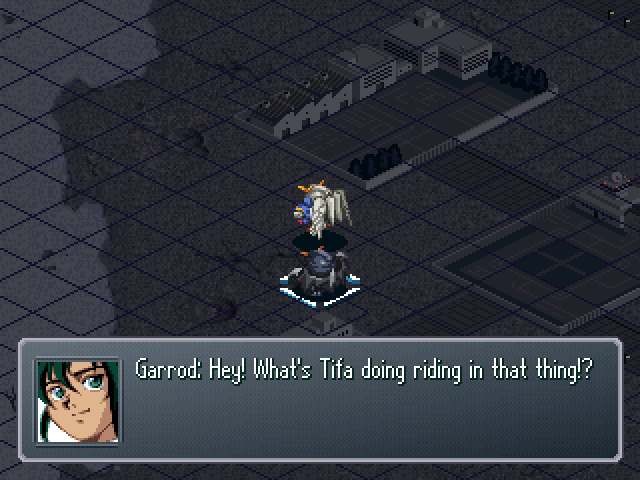 Tifa and I are going to rescue you with the GX!! 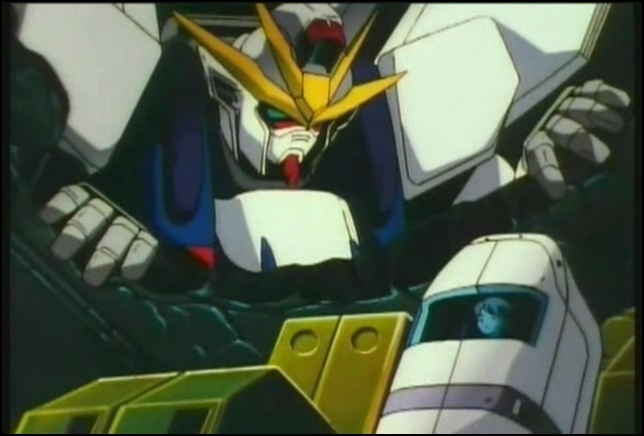 : Cursed Gundam... The Devil Weapon that caused the Black history... You shall pay dearly for the sin of ruining the Earth in the old war! : The environment was scarred by the historic war between the moon and Earth. Due to that, people had to move into domes and adapt their own bodies. : Adapt... Their own bodies!? : After months and years, Earth is starting to support life again, but... The Innocent's dictatorship remains, they don't grant independance. By ruling with an iron fist, it's not leading to progress, but regression. 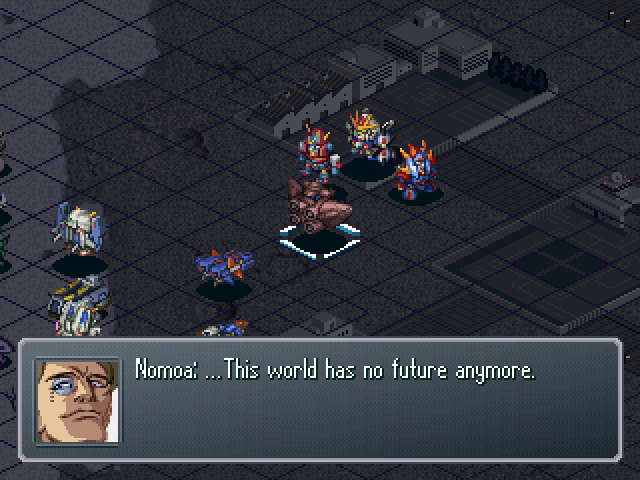 I can't accept that kind of future. So I'll ruin the Innocent's system... I'll spurn this whole wretched era. 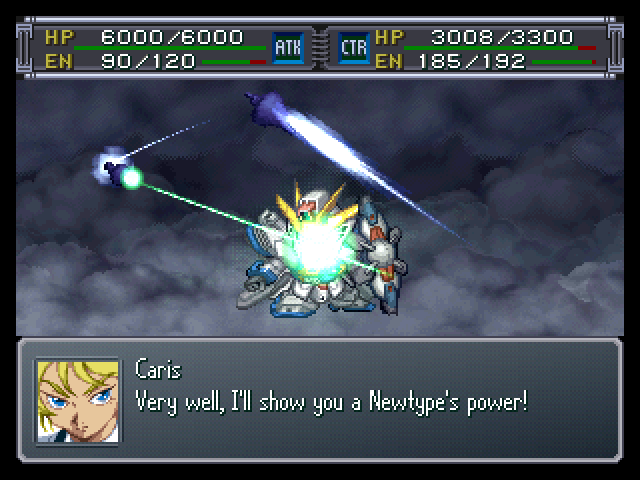 Caris became a Newtype for that as well. : That's not true... Open your eyes and take a look around you. Caris... Open your eyes. Open them and look around you. 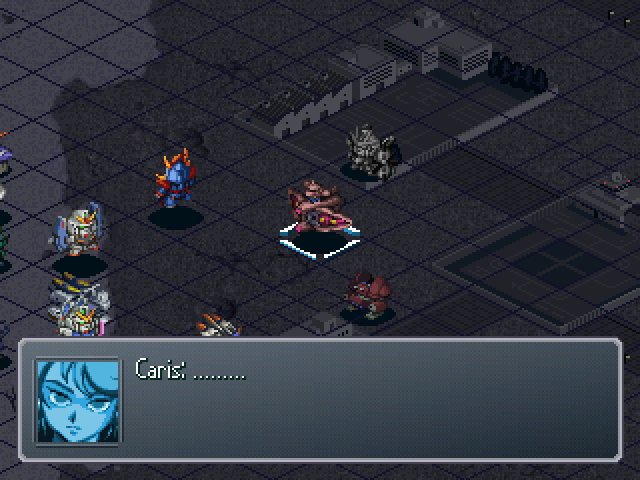 : Caris! Can you hear my voice!? : Stop this! You swore, didn't you!? You promised we wouldn't fight anymore!! 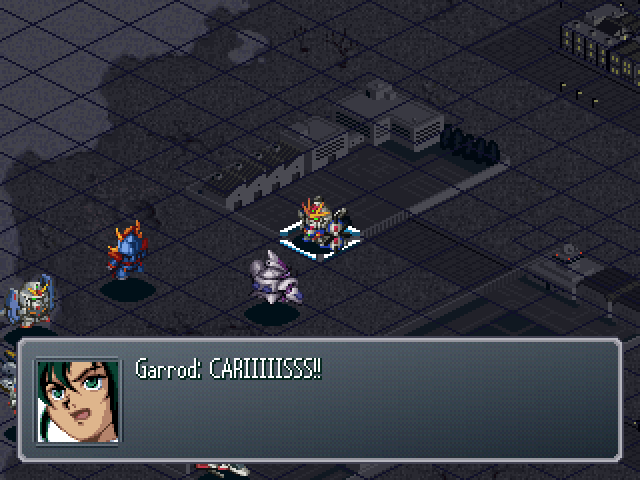 : Garrod, Caris is in that area! : Alright! 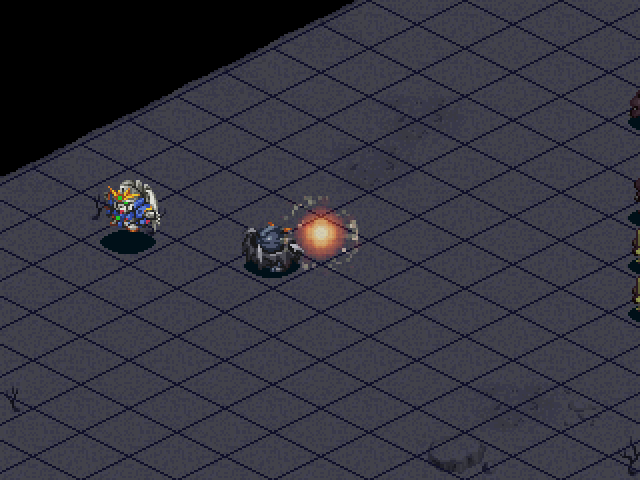 I'll break through to the control block and get him out!! : OK! I've got Caris out safely!! Hola and Vickman Hightail it after the Patulia bites it. 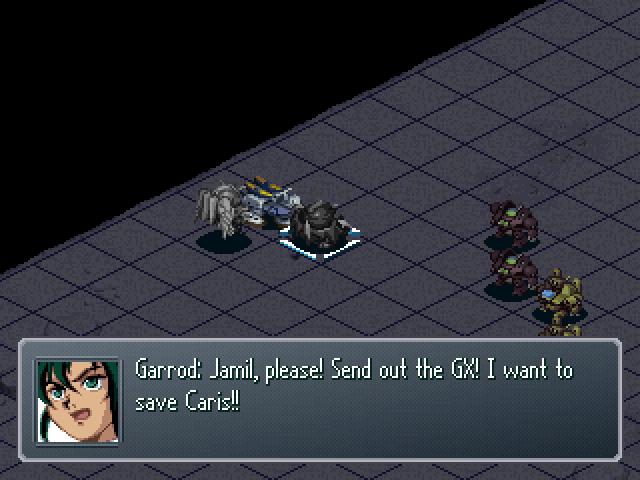 : Garrod, hurry and get Caris to the Freeden's Infirmary!